Hello and welcome to the first Fluffy Friday! Now on our 6th child, we have decided to take the plunge into Cloth Diapering! Saves money... on both diapers, and garbage removal! Less smelly. A garbage full of foul diapers smells terrible...with cloth you rinse all the stink away! They look awesome! I love the design of cloth diapers! Okay, so there are our reasons....now here is the benefit to you! 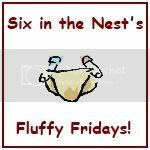 Over the next couple of months (or maybe longer) I will be posting a review, and sometimes a giveaway, and a cloth diapering tip every Friday! Lots of things to learn, you know? If you have a question, please feel free to post it, the answer may be the next week's tip! Do you blog? Do you blog about cloth diapers? There will be a linky at the end of each post to add your cloth related links to! All I ask is that you put my FF button on your blog in return! Best Bottom Review AND Giveaway! Link up your posts about CLOTH diapers or cloth accessories here!Please post my button somewhere on your blog, all links that are not cloth related will be removed. BUT it definitely saves a lot of money, and tey are soooo much cuter than disposables! Looking forward to following you on your journey into fluff-dom! Great! I am excited to have you as a reader Rachel!